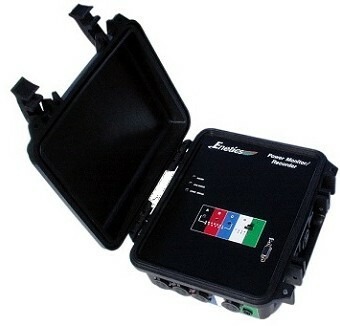 The LM5400 series is comprised of two unique 3-phase 600v recorders (LM5410 and LM5415) each capable of simultaneously recording all energy parameters including frequency for 4 voltages and 4 currents. The 5415 adds disturbance (sags, swells), both Voltage and Current individual and THD and waveform recording. The fourth voltage and current channels can record neutral ground voltage and neutral or ground current. These units provide practical power monitoring needs by providing all the features required by your front-line personnel. Disturbance monitoring for sags, swells on both voltage and current individually and THD, plus waveform capture recording (on event or time trigger), harmonic magnitude recording and paging (modem option required). Software calculates recording time. Waveform capture reduces recording time dependent on number of events and number of cycles saved/event.